And now, I've made it to the last book I own by Camilleri, The Track of Sand. I'll be getting Potter's Field in September, so I'll be returning to Inspector Montalbano in only a couple of months. As much as I love this series, it's time to move on for a bit -- to another detective, another country, another climate. And I really have to get back to the literary fiction at some point because the Booker Prize longlist will be announced at the end of July, which is a two-month stretch of reading. And before I launch into my post on Track of Sand, I also want to note that reading these novels has made a huge impression on me, not only in terms of these books, but I've decided that after I finish off the CWA International Dagger shortlist, I'm going to start reading crime fiction novels by authors mentioned throughout this series. I've finished all of the Martin Beck series and the Wallander books, but there are still several authors mentioned by Camilleri that I haven't yet read. 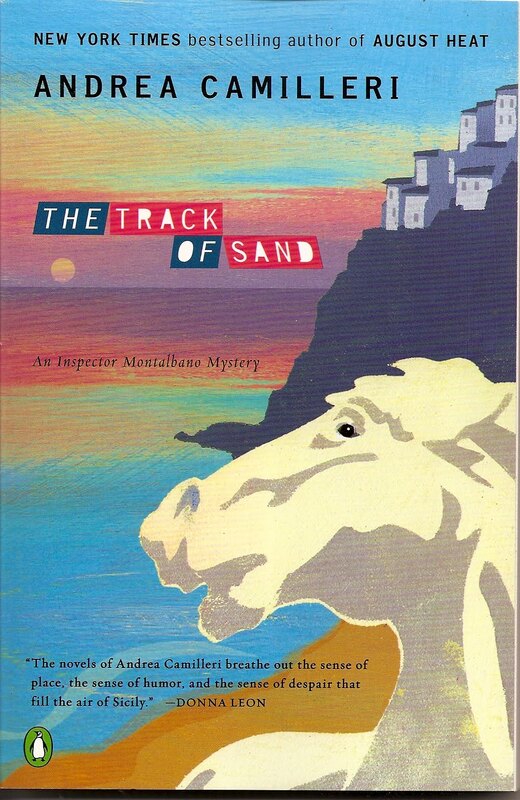 Montalbano's melancholic self reappears in this novel, number twelve in this most excellent and unique series of crime fiction, and oddly enough, it starts with a dream involving a very distorted Livia who turns into a sort of a horse. And even more oddly enough, when Montalbano wakes up, throws open the shutters and looks out the window onto the beach, there's a dead horse laying there. The horse had been brutally bludgeoned with an iron bar, and Montalbano determines that there were at least four culprits involved. He calls in his colleagues to take a look, and then City Hall to come and remove the carcass. But by the time the city people get there, the carcass has disappeared. It isn't long until a beautiful woman named Rachele Esterman comes to the station to file a report of a missing horse that had been in the Vigata stables of one Saverio Lo Duca, one of the richest men in Italy. The case is puzzling, but it's about to become even stranger, as Montalbano's home is broken into and ransacked. This case will send Montalbano into a surreal world of Italy's aging nobility, clandestine horse racing, a case involving the Mafia and even worse, the beautiful Rachele. And all the while, Montalbano is trying to get his relationship with Livia back on track, which at this point may be more difficult than solving this strange case. Once again, Camilleri has given his readers a few hours of sheer reading delight, in which the old gang is still together, continuing to grow and change like people do in the real world. Montalbano is still concerned with getting older, especially now that Mimi Augello is sporting a new pair of glasses. We also get another insight into Montalbano's character with a lovely reflective set piece in which he remembers a fishing expedition with his uncle, and the unmatched taste of a fried sole. But he's still often amazed at the sheer absurdities of the system under which he lives and works, at television which conveys information "dressed up in details and circumstances that were either completely wrong, utterly false, or pure fantasy," and at the public for buying into it. Yet, this doesn't stop his appetite -- and although he manages to find some of the most unpalatable food in Sicily in this novel, what he gets from Enzo and Adelina more than make up for it. There are a few comical scenes, but as in the book just prior to this one, it seems that aside from the mystery at the heart of this book, Montalbano's more serious side is beginning to take center stage. And, as I've said so many times before, while sometimes the circumstances surrounding the crimes or their solutions might be a little murky or uneven, by book twelve everyone knows that you don't really read these books for the mystery elements -- they take on a life of their own. This book is no exception. I can't end without a note about the translation by Stephen Sartarelli: I've said this before, but these books are so nicely rendered into English that sometimes I've forgotten that I'm reading a translation. I have appreciated the notes at the end of the books, which have been quite helpful and have helped to illuminate some situations in which an English translation may not have exactly fit. Let me just say this: I love these books, I love the character of Montalbano and those of his quirky colleagues, and there will never be another series of novels like this one. To Kathy d: thanks for the comment, but I'm using the iPhone & accidentally deleted it! My apologies! !